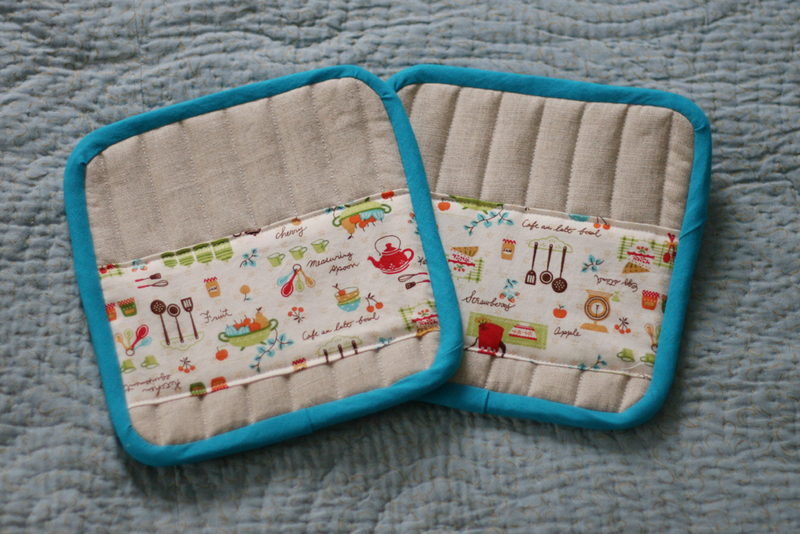 I saw these cute pot holders over at Liesl Made and immediately loved the simplicity of them. 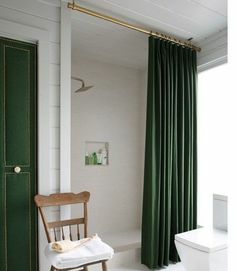 I just happened to come across a grey linen remnant at Joanns recently and thought this might be a great project to use some on. So even though there’s a great step by step tutorial on their blog, here’s my own words on how easy they were! (4) 10″ x 10″ linen squares. (6) 10″ x 10″ cotton batting squares. (2) 41/2″ x 8″ quilting cotton pieces. (2) 35″ x 2″ binding or make your own. I cut an 8″ x 8″ square from computer paper. Folded into quarters (half then half again) and rounded the edges all at one for symmetry. Layer 1 linen, 3 batting, 1 linen. Lay paper pattern on top and trace around. Mark center. Measure in 1″ increments from center and mark. These will be stitching guides so mark top and bottom as shown above. I then used my rotary cutter to cut out body of the pot holder that we originally traced. Fold edges under 1/2″ on cotton pieces, place about 1 1/2″ from the bottom and sew on using a 1/8″ top stitch. Form loop with ribbon and secure using 1/8″ allowance. Attach binding and you’re finished! I did mine as I would quilt binding and machine stitched first, then did the other side with hand stitching. I have this vision for my kitchen of grey walls, white glass front cabinets with maybe an aqua painted in the back of the cabinet for color pop (as well as some solid white cabinets for the junk you just don’t want people to see .Lol.) Some lovely white Kate Spade dishes with platinum silver dots. Bowls of fresh colorful foods. 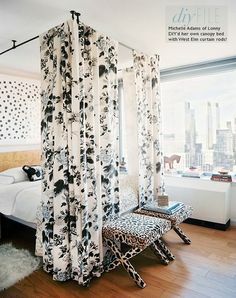 basically neutral with color pops so that there aren’t specific color schemes and any pop of color will add to the room and fit in. These little pretties are the first step to that dream kitchen. I’m planning to make up coordinating placemats soon, so be on the look out!! they came out great! I think I might give it a try, am always buying pot holders and they turn out to be so thin. I love it that you added in your own take on how to make it. I find sometimes I don’t always understand how a person did something and it’s always great to have someone else to refer to. Thanks for sharing at Whimsy Wednesdays at The NY Melrose Family. Can’t wait to get some batting and give these a try! Thank you, I really needed to find something like this, my mom seems too take all of my hot pads.